The alternatives to a UCG base-load power plant for South Africa are conventional coal based power plants, nuclear power plants and renewable energy (wind and solar) with storage. UCG offers significant advantages over these alternatives. The environmental impact of traditional coal mining and boiler power generation has brought about a policy decision by the Department of Energy to strategically implement alternative technologies for power generation. Low carbon-dioxide nuclear power seems the obvious alternative, but nuclear based power generation has the highest capital cost and longest lead times and is being phased out throughout the world. First and foremost is that renewable electricity is not a continuous power supply and is only available 25% of the time as renewable energy is dependent on sunlight or wind, and a continuous supply of energy cannot be guaranteed. 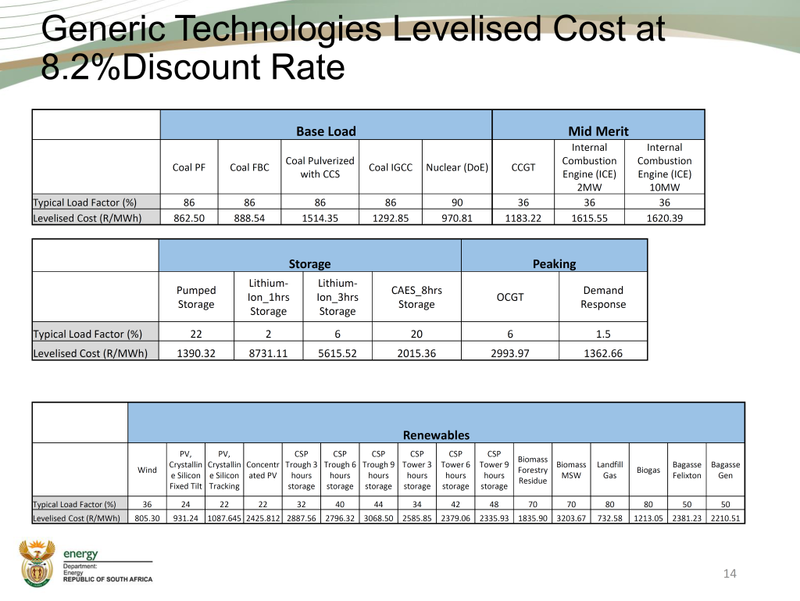 Secondly is price, both solar and wind based power generation with storage is still considerably more expensive per unit of electricity than many of the other alternatives. UCG offers the best alternative for South Africa: with costs comparable to current coal based power generation, without the environmental impact of coal mining and PF boilers or the safety issues of nuclear based power generation. UCG= Underground Coal Gasification provide the fuel for a high efficient IGCC power station and Africary estimates the price of a 600 MW plant to be about 1190.00 to 1300.00 R/WMh with a 90% load factor. UCG also contributes additional economic value as it utilises previously stranded domestic resources for power generation, allowing South Africa to export other minable resources which would otherwise been used for power generation.